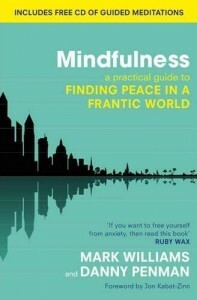 There are now many books on mindfulness. Here we highlight some books by the originators of MBCT and their teams – including books for practitioners and the general public – and some of the team’s books on the clinical and philosophical roots of mindfulness. 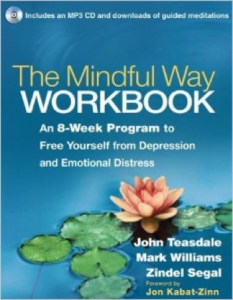 If you are a mindfulness teacher or a therapist and want to learn more about the use of the mindfulness approach for people who remain vulnerable to depression, the approach is described in the Second Edition of this classic work by Zindel Segal, Mark Williams and John Teasdale. Written in a practical and accessible manner, it describes the eight week programme in detail, and also tells the story of how the authors came to develop MBCT using clinical transcripts that bring the programme to life. …In reading this new version, appearing ten years after the first edition, I was struck by two things. One was how much exquisite new material has been added, not just in the form of new chapters, but subtle revisions and restructuring of the text itself, refining, amplifying, and strengthening a number of key elements that ten years of experience have made clear are critical to the effective delivery of MBCT in clinical settings, as well as to the understanding of the underlying and very clearly described theoretical framework upon which it rests. The other is that, in going back and forth between the first edition and this one to see exactly what was changed and how, I was deeply moved all over again by how thorough, beautifully developed, and well-argued the first edition was — in a tone at the same time invitational, logical, understated, and modest”. From the authors of the bestselling The Mindful Way through Depression—which explores how mindfulness can break the cycle of chronic unhappiness—this carefully constructed workbook is written for those who are struggling with depression, anxiety, and other forms of emotional distress. It shows the reader how to build a mindfulness practice in 8 weeks. Basic mindfulness principles and facts about depression and other common emotional problems are combined with specific mindfulness exercises to try on a daily and weekly basis, plus a wealth of interactive features that encourage and motivate. Readers will be drawn in immediately by self-assessments, reflection questions and exercises with spaces to jot down notes, worksheets for keeping track of progress, and quotations and questions from others going through the program. Each week’s guided meditations are provided on the accompanying MP3 CD and can also be downloaded by purchasers. As the most clearly laid out description of the theory and practice of MBCT to date, it is also proving of interest to mental health professionals and students. 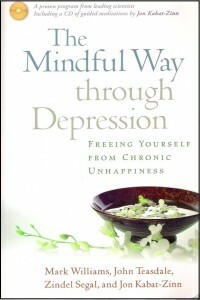 The Mindful Way Through Depression by Mark Williams, John Teasdale, Zindel Segal and Jon Kabat-Zinn has been written for all those who have struggled with depression. Mindfulness can be a simple yet powerful way of paying attention to your most difficult emotions and life experiences without obsessing over them.It can help you break the cycle of chronic unhappiness once and for all. The authors explain why our usual attempts to “think” our way out of a bad mood or just “snap out of it” lead us deeper into the downward spiral. Through simple lessons drawn from both eastern meditative traditions and cognitive-behavioral therapy, they demonstrate how to sidestep mental habits such as rumination and self-blame that inevitably lead to despair, so you can face life’s challenges with greater resilience. Jon Kabat-Zinn gently and encouragingly narrates the accompanying CD of guided meditations, making this a complete package for anyone seeking to regain a sense of hope and well-being. 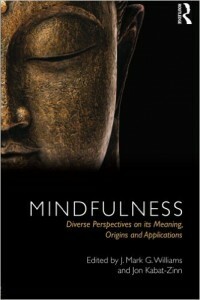 Mindfulness: Diverse Perspectives on its Meanings, Origins and Applications provides a place where wisdom teachings, philosophy, history, science and personal meditation practice meet. It was originally published as a special issue of Contemporary Buddhism. 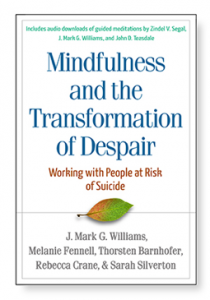 Grounded in extensive research and clinical experience, this book describes how to adapt mindfulness-based cognitive therapy (MBCT) for participants who struggle with recurrent suicidal thoughts and impulses. Relevant to all mindfulness teachers, a comprehensive framework is presented for understanding suicidality and its underlying vulnerabilities. The preliminary intake interview and each of the eight group mindfulness sessions of MBCT are discussed in detail, highlighting issues that need to be taken into account with highly vulnerable people. Assessment guidelines are provided and strategies for safely teaching core mindfulness practices are illustrated with extensive case examples. The book also discusses how to develop the required mindfulness teacher skills and competencies. Purchasers get access to a companion website featuring downloadable audio recordings of the guided mindfulness practices, narrated by Zindel V. Segal, J. Mark G. Williams, and John D. Teasdale. 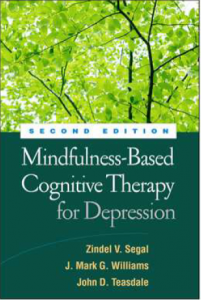 See also Mindfulness-Based Cognitive Therapy for Depression, Second Edition, by Zindel V. Segal, J. Mark G. Williams, and John D. Teasdale, the authoritative presentation of MBCT. Why do people commit suicide? Is it a cry for help or a cry of pain? 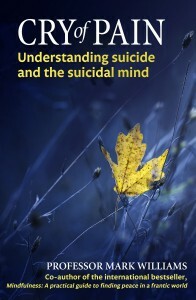 In this thought-provoking book Mark Williams offers new perspectives on suicide and suicidal behaviour. For therapists and clinicians who want to help those who are vulnerable and their families, there are also puzzles that often seem unsolvable. What is it that causes someone to end his or her own life, or to harm themselves: is it down to a person’s temperament, the biology of their genes, or to social conditions? What provides the best clue to a suicidal person’s thoughts and behaviour? Each type of explanation, seen in isolation, has its drawbacks, so we need to see how they may fit together to give a more complete picture. Cry of Pain examines the evidence from a social, psychological and biological perspective to see if there are common features that might shed light on suicide. Informative and sympathetically written, it is essential reading for therapists and mental health professionals as well as those struggling with suicidal feelings, their families and friends. This book is written for a general readership and introduces mindfulness practice to those who find themselves over-busy, stressed and exhausted. This book lays out, concisely, the distinctive features of mindfulness-based cognitive therapy, and explains fully and clearly the key theoretical and practical features of the approach.